[S15] George Edward Cokayne, editor, The Complete Baronetage, 5 volumes (no date (c. 1900); reprint, Gloucester, U.K.: Alan Sutton Publishing, 1983), volume I, page 30. Hereinafter cited as The Complete Baronetage. From 16 September 1609, her married name became Gerard. 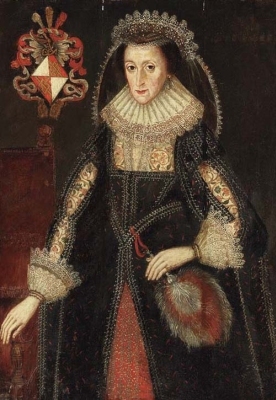 From circa 31 October 1636, her married name became Needham.1 After her marriage, Eleanor Dutton was styled as Viscountess Kilmorey circa 31 October 1636. [S6] Cokayne, and others, The Complete Peerage, volume V, page 635. [S6] Cokayne, and others, The Complete Peerage, volume VII, page 261. [S22] Sir Bernard Burke, C.B. LL.D., A Genealogical History of the Dormant, Abeyant, Forfeited, and Extinct Peerages of the British Empire, new edition (1883; reprint, Baltimore, Maryland: Genealogical Publishing Company, 1978), page 229. Hereinafter cited as Burkes Extinct Peerage.